You are here: Home / Articles / Can Vitamins Save You Thousands of Dollars? 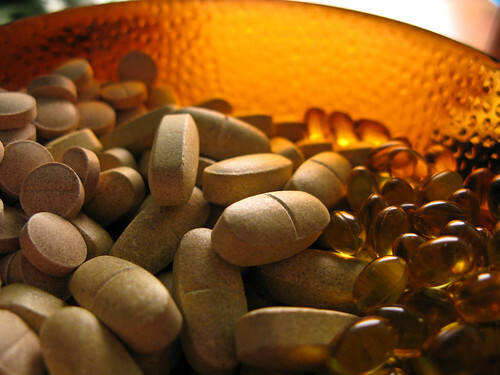 Can Vitamins Save You Thousands of Dollars? Disclaimer: I’m not a doctor and I’m not speaking on any authority on this subject. I’m only basing the following on my own experience. Talk with your own health provider for specifics situations regarding your own health. I recently had to get a root canal, which itself was not bad. It was the pain proceeding the root canal that was awful. I have a high pain tolerance, having four children without pain medications but the pain from my infected tooth was intolerable. When I get the bill, we will re-evaluate how painful it was again. ha! It all started with three cavities in late 2009. Mind you, I’ve only had around three cavities in my whole entire lifetime before this outbreak last year. The dentist did ask me if I had any health changes, of which I said, no, except I did go vegetarian. This didn’t seem to be a big deal. I’ve had problems with one particular tooth (#19 for those professionals out there) ever since this filling. Leading up the grand pain finale this past weekend. Come to find out, I’m just one of those “lucky” ones whose nerves never recovered after a filling. It can’t be because I don’t brush and floss because I’m diligent in both areas. Even Bryan said, this is a perfect case of brushing 2-3x a day not meaning anything, which I hope the kids didn’t hear. I don’t want them thinking they can get away with brushing just once a day. Now, let’s go back a little further. When I made the decision to go vegetarian in the spring in 2009, my mom was adamant that I take Vitamin D, B12, and a multivitamin regularly. Being the kid that I am, I was diligent for a few days and then life happened. I was too busy in the mornings to take my vitamins, they made me feel sick on a empty stomach, etc., etc. I should have listened to my mom. Cuz, you know moms are always right. Kids, are you reading this? I did start to notice I was a little crankier, I felt exhausted, and I just didn’t feel the same. I never would suspect I had any type of deficiency. Instead, I silently blamed it on being overweight, which I’m sure did contribute to those symptoms. This summer, I started seeing a wellness doctor, who ran a whole battery of blood test. BINGO, I have a Vitamin D deficiency, which means, oh, yeah, mom was right. Turns out, Vitamin D is pretty important to your well being. Having an office job and not eating fish, eggs, and milk is a good way to not get your recommended daily allowance of Vitamin D. Vitamin D is important for bones, mental health, general immune system and more. Here’s my question? Would a family doctor even check for a Vitamin D deficiency if you went into their office complaining of depression, crankiness, mood disorders? Would they prescribe you an anti-depressant right now? I can’t really answer those questions. I can wonder about those question, though. I do know I’ve never been told to take Vitamins by a physician except when pregnant until recently when I started seeing a Wellness doctor. So it comes back to the question, would a inexpensive vitamin (you know basically free with those CVS Extra Bucks!) saved me thousands of dollars? I don’t know the answer for sure but studies have shown there is strong evidence between Vitamin D deficiencies and cavities among other issues. After this painful experience, I’m militant about taking my multi-vitamin along with a handful of other vitamins every morning. All of these vitamins have been recommended to me by my doctor based on my personal blood results, family history, and lifestyle. I have noticed that I started to feel better just a couple weeks after taking these on a regular basis. What Vitamins do you take? Do you feel that they are important to your life long health? Oh yeah! I have health insurance, but hardly ever have to use it now! I want to give folks a heads up, some insurances cover vitamins. One I had before had a mail order program where you pick what you want them to send, and you just pay the s&h! I never actually used it because I liked what I was using and am sticking with it, but that sounded like a great bargain, It wouldn’t hurt to check with your insurance, right? I read it in that huge packet they send you when you enroll. Love you Briana, keep up the great job! For a vegetarian it’s really important to watch their vitamin intake as vitamin deficiency has been linked to depression in many scientific studies. I also take fish oils which I believe are responsible for finally going off meds for hypertension. Check out more quality vitamins too, they work even better! I’ve started taking a daily multivitamin when I take my other medications. It means I remember to take it every day, but I can’t say that I see a difference. I think this is pretty interesting! although it hasn’t been proven, I would have never even THOUGHT there was a link between vitamins and dental health/hygiene. Thanks for the informative article! FABULOUS article! I had a similar situation. I have been ‘mildly’ anemic off and on my entire life. I took my iron when I thought about it…which wasn’t very often. Earlier this year I had heart irregularities and extreme exhaustion. After thousands of dollars in tests that showed nothing, the doctors wanted to give me anxiety medication but thankfully I knew better. I found a holistic doctor who immediately ran an intensive iron screening (not just a CBC) and BINGO! I had a severe ferritin (serum iron) deficiency which can effect your heart if left untreated. Within 1 month of taking iron I felt like a new person. I had more energy that I could remember having in a long long time. Have you found a good iron source that doesn’t constipate you?